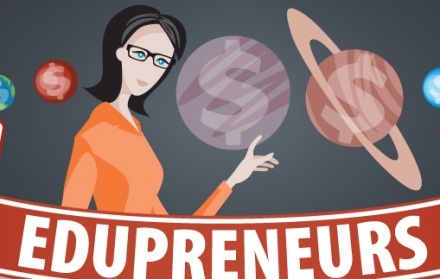 Entrepreneurship Educators Need to be Rewarded too! It’s that time of year when high school seniors are looking for scholarships to fund their college education. So teachers get to write all kinds of letters of recommendations. But this year is different. This year, teachers can get a scholarship too. The National Federation of Independent Business (NFIB) Young Entrepreneur Foundation is offering a scholarship dedicated to teachers who emphasize the importance of entrpreneurship in the clasroom. The Entrepreneurship Educator Award will grant a $1000 scholarship to honor and encourage a hard-working teacher to continue their entrepreneurial instructions. The NFIB Entrepreneurship Educator Award is available to any educator of students (grades 1-12) who teaches entrepreneurship in a creative and successful manner. Applicants are asked to create and submit a video through which they answer the following question: What best practices have you used to teach entrepreneurship and what has been the outcome? Applications will be accepted until March 31, 2015. The winning video will be presented at the NFIB Young Entrepreneur of the Year Award Luncheon in Washington, D.C., in the spring of 2015, and the winner will receive a $1000 scholarship which they may use for educator training or to obtain educational resources. Entries will be reviewed by the Young Entrepreneur Foundation staff and the winner will be selected based on the creativity of their entrepreneurial program best practices, as well as the extent to which the video demonstrates the positive impact of entrepreneurial education. Check out the website to find more information about the award and the application process and to view last year’s winning video: www.nfib.com/educator. The NFIB Young Entrepreneur Foundation Entrepreneur-in-the-Classroom (EITC) supplemental curriculum exposes students to entrepreneurship and the necessary steps to take an idea and turn it into a business. The FREE curriculum can be integrated into classes teaching a variety of subjects including music, art, fashion, business and many more. You must be registered to view the full Entrepreneur-in-the-Classroom curriculum. The NFIB Young Entrepreneur Foundation is a 501(c)(3) organization promoting the importance of small business and free enterprise to the nation’s youth. More information is available at www.NFIB.com/YEF. The Foundation is associated with the National Federation of Independent Business; NFIB is the nation’s leading small business association, with offices in Washington, D.C. and all 50 state capitals. Entry filed under: Educators, Entrepreneur, Teachers. Tags: education, Entrepreneur in the Classroom, entrepreneurial education.